PDF of the entire issue (5.43 Mb). Pages 2-4: The global culture of science is constantly evolving, but today we are in a period of profound, rapid change. 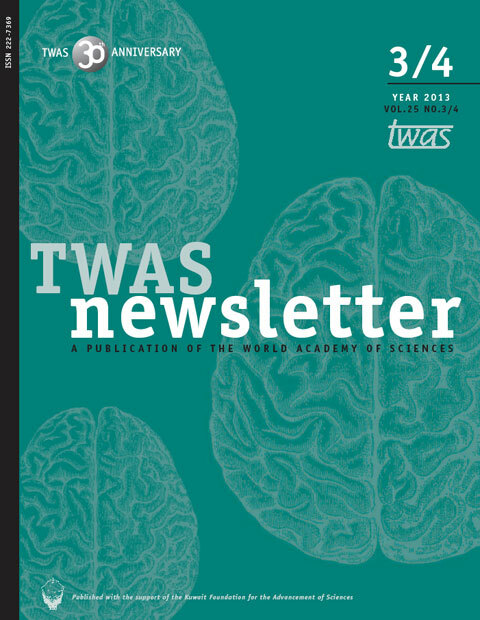 TWAS is changing, too, to maintain and extend its leadership on issues of science and engineering in the developing world. Bai Chunli: "At 30, I stood firm." Pages 5-8: In his opening address to the TWAS General Meeting, Academy President Bai Chunli cited the words of Confucius to underscore the significance of the Academy’s 30th anniversary. "We have earned a position of respect in the world of science," he declared. "The global family of science relies on us." Pages 9-10: At the 2013 General Meeting in Buenos Aires, TWAS members celebrated 30 years of accomplishments by the Academy and its members. But there was a strong focus on the future. Pages 11-15: Science ministers and top policy leaders meeting in Buenos Aires explored how to advance science education and innovation in a challenging international environment. Page 16: Fifty-two new members were elected to TWAS during the Academy’s 24th General Meeting, held in Buenos Aires from 1 to 4 October 2013. With those new Fellows, TWAS membership rose to 1,105. Pages 17-19: TWAS-Lenovo prize winner Claudio Bunster Weitzman advanced both theoretical physics and Chilean science. Pages 20-25: TWAS Prizes recognize achievements of scientists from the South. Pages 26-28: Fu Shuqin and Immacolata Pannone received TWAS-UNESCO lifetime achievement honours in Buenos Aires. Pages 29-32: High-impact vaccination programmes. Reactors to purify drinking water. A database that illuminates the causes of poverty. Three highly focused projects carried out by scientists from the developing world won high honours at the TWAS General Meeting. Pages 33-36: Argentinian neuroscientist Francisco Barrantes has spent a career bringing the finest details of the nervous system into sharp focus. Advanced technology provides new insights, he says, but many mysteries remain. Pages 37-40: It's important for young scientists to work overseas, says influential Brazilian physicist Luiz Davidovich. And it's important that they return home to strengthen their nations and their people. Pages 41-43: Diego Golombek, one of Latin America's most influential science communicators, has a message for researchers everywhere: Abandon jargon, embrace enthusiasm – and please, no more potted plants. Pages 44-48: In a new documentary, Seeds of Science, Italian filmmaker Nicole Leghissa explores how researchers in Kenya are transforming farms, laboratories, communities – and people's lives. Pages 49-51: From China and South Africa, two women scientists devise new strategies to solve problems and make a difference in their countries. Pages 52-53: At the annual TriesteNext science festival, TWAS joined with other local science centres on a photographic exhibition that spanned the world of scientists at work. Pages 54-55: Brief news about honours, appointments, awards and events.